This post is part of my All Things Grants series, where I walk through different aspects of finding, writing, and submitting successful grant applications. Find out how to make sure you’re applying for the right grants, and stay tuned for more! Look to see who funds similar organizations. Build connections through your board and staff. Ask current funders for connections and introductions. According to the Foundation Directory Online, only about 10% of foundations have a website. That means if you are only relying on Google searches to find grants, you are missing out on the majority of funding opportunities available! When it comes to identifying grant opportunities, it is vital to make sure you are able to access the full scope of available opportunities in order to find the best fit for your organization’s needs. To do this effectively, you must utilize a grants database. Which grant databases should we use? One of the grant databases I use is called Foundation Directory Online. Many main branches of public libraries have the option to access this database and others for free, which I highly recommend as subscriptions can get pricey. In addition to the Foundation Directory Online, there are many other grant databases to utilize in your grants search process, such as Grant Station and Grants.gov , and local and regional grants guides. Check with your local nonprofit resource centers and associations to find out if there are grants databases specific to your state, and how you can access those databases for a reduced rate (or free!). What should we include in our database search? When searching for grants through a database, use keywords from your programs to target the most relevant funding options. Also, many databases offer preset keywords and phrases to uncover relevant grants that make the most sense for your organization. If the search results are inconsistent with your funding goals, use synonyms and similar phrases to narrow or widen your search. Do they provide the same or similar services somewhere else? Do they serve your same geographical area? Do they serve your same population? Then, research their funders. If you’re feeling confident, go ahead and give these organizations a call to inquire further about their funding ideas and recommendations. Many organizations are open and interested in collaborating to meet the needs of your shared population. If they aren’t interested in sharing or you aren’t comfortable asking, use a grants database to search previous grants they’ve received. Some organizations also include this information on their website, annual report, or social media as a way of thanking grantors. While databases and similar organizations are essential resources for your grants search, never underestimate the power of network connections among your organization’s board and staff. Take time to ask your board and staff members if they have any connections to foundations and grantors, or if they have any ideas for funding opportunities. After all, they are already invested in your organization! They may have connections in the community that can increase your organization’s funding. How do I get introductions from our board and staff members? Are there any foundations that you are connected with (or any people in your network that work at foundations or serve on foundation boards)? Do you know of any grant opportunities that we could potentially apply for? Do you have any ideas for funding opportunities? If this doesn’t yield the results you were hoping for, identify specific grant opportunities you are going after and print a list of those foundations’ board and staff members. They may not remember that their connection works at a foundation, but could see their name and then make an introduction. Disclaimer: make sure that your board and staff know who is responsible for applying for grants. It is important that they understand that you are not expecting them to go out and apply to grants on their own, as that can cause confusion and chaos within the organization. However, encourage these members to forward any funding information or connections to one point person. 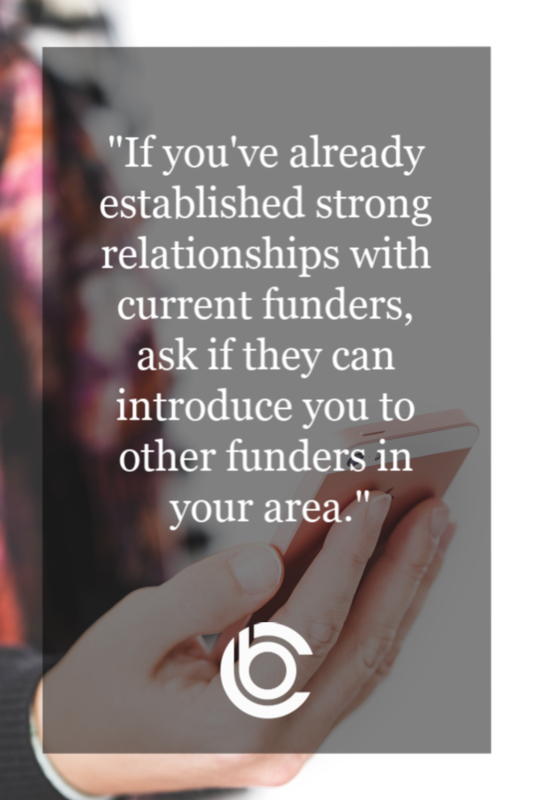 If you have already established strong working relationships with current funders, ask if they can introduce your organization to any other funders in the area. Often, funders know other people serving the same types of organizations or populations who may offer similar or different funding options. How can I best approach funders to develop further connections? Assuming your organization has a good relationship with the funder (this is KEY), simply reach out and say, “We are looking for additional grant opportunities we can apply for. Do you have any ideas for us, or is there anyone that you could introduce us to?” Fortunately, if they have already given you money, they are genuinely interested in helping your organization succeed. They may be happy to give you ideas or make introductions to help connect your organization to other resources. Want to learn more about how to find, write, or submit grant applications? Download our Six Steps to Successful Grants and sign-up for our next Six Steps Masterclass! I’m Amanda Wallander Roberts, MSSW, a consultant passionate about building fundraising and evaluation capacity with social organizations. I’ve helped over 60 social service organizations fundraise and evaluate programs, including raising over $23 million and developing more than 50 logic models, evaluation plans, and process maps. Learn more about my services or contact me for support today!